New memoQ is coming and you’d better grab it as soon as it arrives! Kilgray assumed a steady schedule of new major memoQ versions – once a year, somewhere during the summer. This time it’s June, the version is 2014, and the list of changes and new features is really, really long. 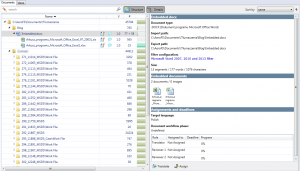 I have the privilege of using the “preview” copy of memoQ 2014 and below I have summarized some of the new features and my experience of using it exclusively for the last two weeks. When I received access to the memoQ 2014, I’ve also got a file with a short description of main changes/new features which covers 26 points. Overall there are over seventy new features/improvements in this version, and it’s a huge list. I don’t think there were ever so many new goodies included in a new memoQ release, and I’m using the software since version 3.6. These changes are big and small and I must admit I’m often finding these little ones very helpful. I’ve already tweeted about some of them, but I’ll try to mention them here too. This is huge. Both for PMs and individual translators. Basic idea is that you can define a template for a project with particular settings and then create new projects in just three clicks (not including importing files for translation). Obviously it won’t be useful for every kind of projects, but I think everyone does have some projects that can benefit from this kind of automation. In my case it’s a broad category of MSDS-related translations (this includes translation of MSDS documents, chemical compound names and sentences and phrases related to REACH, ECHA and CLP). I can safely use single, end-client independent TM for them as well as fixed set of TBs and reference LiveDocs. Previously I had just one “standing” project for MSDS jobs – I was adding new documents for translations, occasionally removing old ones, when the list became too crowded. Now I’ve defined a template: when creating a new project all I have to do is to import documents and enter the project name. I can use just one TM or memoQ can automatically add all TMs or other heavy resources with a defined set of metadata (e.g. domain and subject). After the files are imported to the project, they are automatically analyzed – you can define quite a lot of automatic actions, like pre-translation or copy source to target. Now, there is an interesting part: you can define separate working and master TMs. Master TM will be used for pre-translation and reference while working TM will be used to store confirmed translation units. To populate master TM with your current translation you need to use Confirm and update rows command. My first thought was “it does have its merits, but it’s messy and a lot of work”. But not necessarily – thanks to automation you can automatically populate master TM and delete working TM by executing new Wrap up command. If you are performing a lot of verification and correction steps, it’s an easy way of keeping your master TM clean. And if you don’t, you can still use just one working/master TM. At the moment there’s just one quirk: memoQ will insist of adding language combination to your TM name, so in my case when I defined “MSDS” TM, in projects from template memoQ created new, empty “MSDS-en-pl” TM. In the end I’ve cloned my TM calling it “MSDS-en-pl” and then it finally worked. 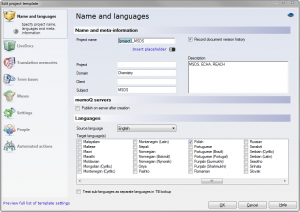 (The template setting for TM is still “MSDS”, but memoQ actually uses “MSDS-en-pl”. It may be a quirk of preview software version and maybe it will be fixed before release.) The interface of template editor could use some polish too, e.g. you can add additional TMs to a template by clicking on their names, but to add master TM you need to type in the name by hand. Nevertheless, templates seem to be very elastic and can accommodate different needs easily, so I’ll definitely define several more templates for other types of projects soon (e.g. for SPCs). Oh, and “wrapped up” projects are displayed in green on the projects lists. Nice touch. When you open the Translation panel you will notice some changes – previous grid with detailed information on file path, import/access date etc. was replaced with much cleaner view with graphical representation of translation progress for files/folders. But most importantly there are two options available here: Structure and Details. Press Structure to display files sorted by folders, with proper nesting. This view will also show you embedded objects mentioned earlier. And you can use Details button to display information on a particular files, including name of the filter used to import the document. Although the colors used for graphical representation of the work status for any given file are not particularly appealing, the idea is great. And if you want to sort files in Translation pane using criteria different than default, just use Sort by drop down. BTW, this version finally fixed long time “order of files” problem in views. 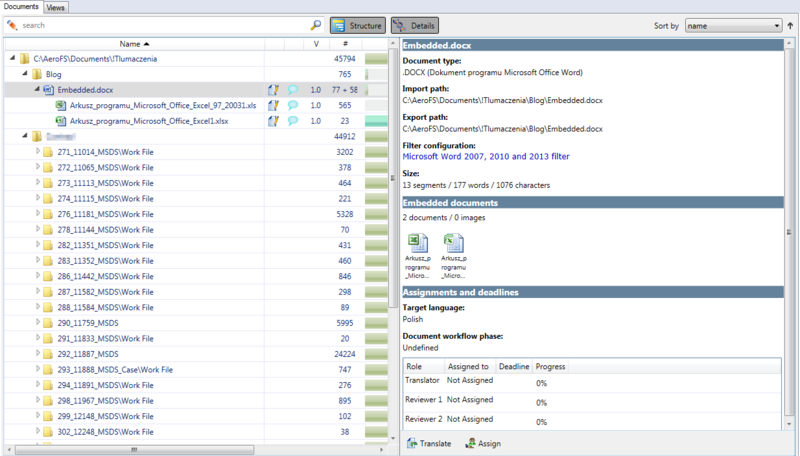 Now when gluing files into view, they keep the order in which they are sorted in Translation pane. And another new feature for views: preview. This obviously works only for simple “glue together”, but it’s very nice nevertheless. The standard way of inserting tags in memoQ is to use of F8 and F9, depending on tag type. Now there’s a new way of inserting tags: Tag insertion mode (F6). When you press F6, mouse pointer changes, showing miniature tag next to insertion point. In the tag insertion mode you can quickly insert (or remove) tags by just clicking with mouse. I appreciated this in one of the jobs I did recently, where I had plenty of high-percentage matches from TM, but the matches had none of the multiple source tags. Using tag insertion mode I was able to insert missing tags quickly and effortlessly. What’s more, there is a new Arrange tags function. If you have messed up your tags, just press Alt-F6 and memoQ will automatically arrange target tags in the order they appear in source segment. This can be very handy. I just wish the feature would be available in Resolve errors and warnings dialog – it would make life even better. There’s a whole batch of new features in this category. We have new TaaS service integration – cloud terminology extraction and management service. When it comes to term extraction TaaS can do more than memoQ. 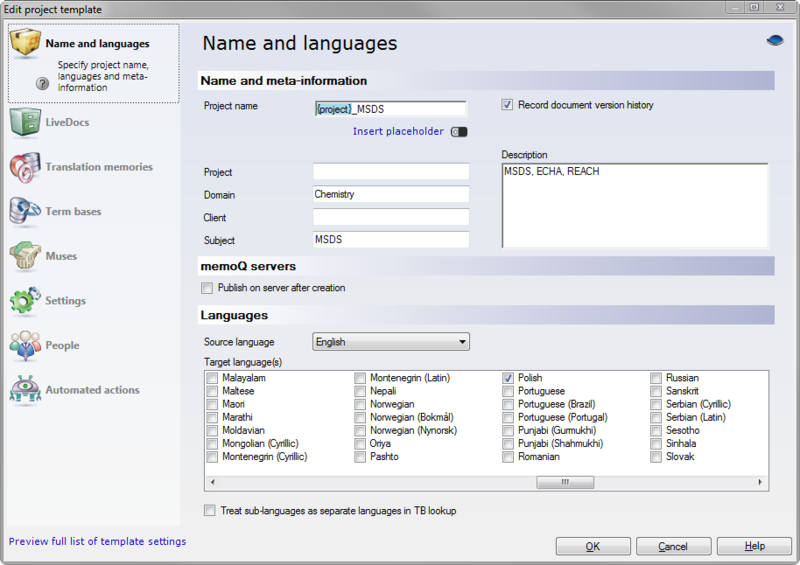 You can create term collections in the service and use them directly in memoQ, almost like local term bases. Finally there is a duplicate detection and removal function (available for TMs too). And it automatically detects an attempt to add duplicate term – this is extremely useful especially for an online multilingual TBs, where it was very easy to create multiple entries for a single term. Term bases can be sub-language sensitive – it means no more EN-GB hits for EN-US project, but it’s an optional, per-project setting. Last terminology improvement concerns Trados Studio packages – now it is possible to import term base content from package too (if there is one in the package). Photoshop image filter: you can translate text layers content. Image localization packages: you can extract images from a file, write instructions, transcribe them and sent out for localization in special .zip packages. Obviously I haven’t tried this, but I’ve seen two presentations and it looks interesting. Grammar checker: for now only Word grammar checker is available. Editing time report: available in Project home/Overview/Reports. Displays information on actual time spent on translation/editing. Although still not perfect, the reports seems to be not accurate (and show time only for no-match segments). I hope it will be fixed before official release. Rename projects and resources: another long-awaited feature. Although don’t try to rename resources you want to use in the older memoQ versions, I’ve run into all kinds of problems with that. All analysis reports automatically saved in Project home/Overview/Reports. This may seem trivial, but for me it’s huge improvement. Until now to get “permanent” report I had to remember to go to Overview and run report from there. Now I don’t have to remember. What’s more, in projects created from templates analysis is performed automatically after file import. Brilliant. As I mentioned in the beginning, there is also a whole lot of new PM-oriented or server-side changes I’m not going to discuss, because I wasn’t able to test them. Overall I’m very impressed with memoQ 2014. Although I’m using not finalized software – something like beta – I haven’t had a single problem with instability or crash. Of course there were some issues, e.g. with Excel filter in the very first release I tried, but they were fixed quickly. Or the QA settings won’t see my language-specific punctuation rules. But the only remotely “stability” related problem I have now is that on one of my computers memoQ won’t terminate its process after I close the program, so if I want to run it again, I have to use task manager to kill the process manually. I definitely recommend upgrading as soon as the new version will become available. I’ll do so myself. Marek thanks so much for going to all the trouble of writing this balanced report. I can’t wait to get my hands on a copy! As you know, it’s usually advisable to wait a few months after a memoQ release to upgrade, but the unusual stability of the current test version and the importance of some feature additions (like those project templates) has me in wholehearted agreement here. I haven’t seen problems with renamed older projects. Yet. What has happened to you?